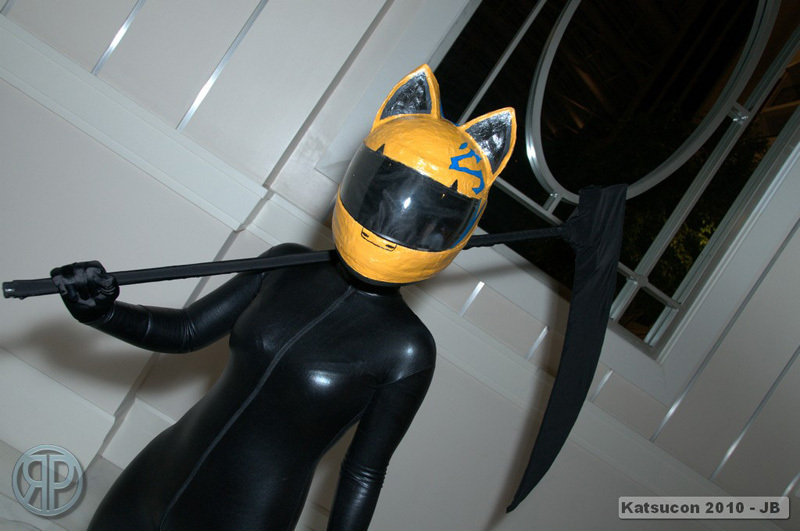 Everyone seems to love Celty Sturluson. Durarara!! is a popular series, and there are many reasons to watch, including a plot full of twists, but everyone seems to love Celty. Lucky, for once, that she doesn't have a head. I can certainly say she is my favorite character without a head. 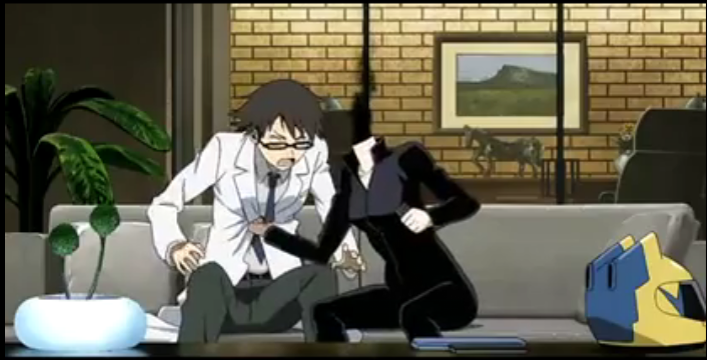 Honestly I’m not a big fan of the headless-moe concept, but Celty manages to be both supernaturally awesome, and have a very human side that people can relate to. I give credit for the latter to Miyuki Sawashiro, her seiyu. Despite the character’s incredible power, the voice acting exposes Celty as participating in the same realm of doubt, fear, longing, and surprise that we humans commonly experience. 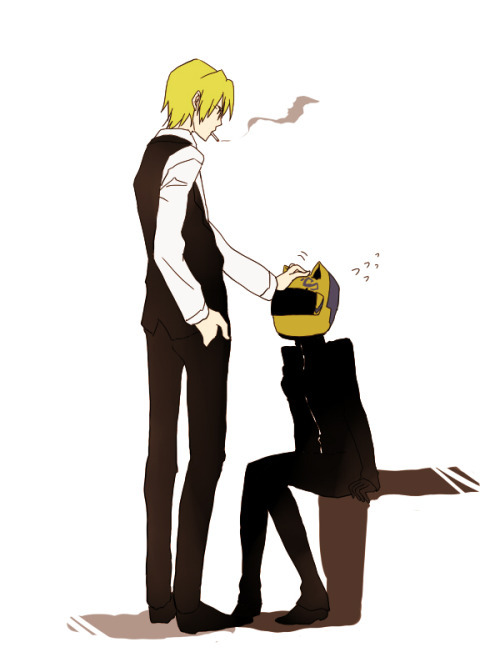 One of the most perplexing things about Celty is her canonical pairing. No, no, no! That is so wrong. Shinra is one of the skeeziest characters on the show. The only kind of attention he deserves. I can’t say I’m a fan of her helmet (or maybe I’m just jealous because my helmet doesn’t have pointy ears) but I do love Celty! The pairing of her supernatural existence and very human behaviour is really beautiful considering all the other oddballs in the show, haha. Ryogho Narita, the light-novelist behind DRRR!! and Baccano! has a very strange idea about people and/or supernatural beings. The characters in Baccano! were strange as well. A couple of them were “normally” evil (specifically Quates), but most were bizarre, and just didn’t fit any convenient stereotypes. Omg finally this anime is getting popular! I love DRRR!! Sure we do! I’m an avid fan of CeltyXShizu-chan. They just suite each other too much. Shinra has a dark side, which I don’t like at all. Cool cosplay! and I agree Celty is a great character even without a head she acts more human than most characters, as for pairing Celty and Shizuo do make a great, Shinra is just crazy! but seems to have calmed down in the weird factor. Thanks for reminding me! I haven’t seen a dubbed episode yet. I’m gonna check it out now. I usually can’t watch, ‘cuz I don’t have cable, but by happy coincidence I was able to catch it last night. oh well atleast you got to watch it and it was a realy great episode. oh and i found a website where you can watch the entire series of drrr free its called crunchyroll.com i watched a few episodes that ive seen already but im going to wait for the rest of the episodes to come on tv because i like to see whats going to happen next. Yeah, CrunchyRoll has some very good shows that you can watch for free. It is worth knowing about. I don’t have any extra $$$, but if I did, I might get a paid subscription (and an iPad) to watch new shows at my leisure. hey have you heard of the show ghost adventures ? oh well its a good show. oh you have seen the shows and moviesof jackass right ? I really don’t follow games.